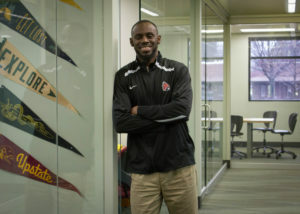 Efe earned his bachelor’s degree in computer science in 2016 from Ball State University while also playing as a Division I football player. He is currently in the process of completing an MBA degree, as well. Efe is an East Lansing, MI native and has been a positive figure in the community since attending East Lansing High. He brings a very sharp, innovative, and versatile mind to the table and is committed to his growth as a young man and professional. Efe is passionate about sports, technology, and entrepreneurship. In his spare time, he enjoys working out, playing basketball, playing video games, and spending time with his family and friends.